Foxes vs. hedgehogs, a history: From Nate Silver, FiveThirtyEight, and Isaiah Berlin back to Archilochus of Paros. Left: a hedgehog. Right: a fox? Photo-illustration by Juliana Jimenez. 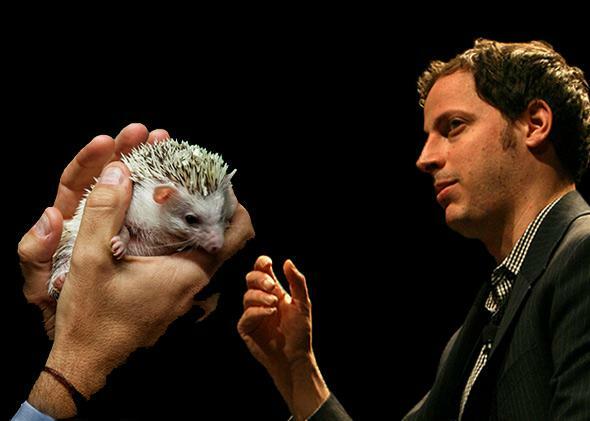 Left: photo of a hedgehog by Giorgio Cosulich/Getty Images. Right: photo of Nate Silver courtesy Randy Stewart​/Flickr. Our logo depicts a fox (we call him Fox No. 9) as an allusion to a phrase originally attributed to the Greek poet Archilochus: “The fox knows many things, but the hedgehog knows one big thing.” We take a pluralistic approach and we hope to contribute to your understanding of the news in a variety of ways. Given FiveThirtyEight’s professed dedication to its methodology, this moment of vulpine self-identification has struck some media analysts amiss (e.g., “I think @natesilver got the fox/hedgehog thing backwards”) and flummoxed some others (“I am flummoxed by this fox/hedgehog thing”). For this reason—and for the sake of tracing the evolution of an antique truth into a postmodern commonplace—I would like to consider the famous phrase in its original context. This parlor game started getting out of hand in the 1990s—the decade of Judy Davis delivering a foxy, Berlin-inspired monologue as part of her sensational performance in Husbands and Wives, of dorm-room CD players inquiring “Are you a fox or a hedgehog?” on Luna’s hedgehogging Penthouse, of Michael Ignatieff’s Isaiah Berlin: A Life identifying its subject as “the type of fox who longs to be a hedgehog.” At the turn of the 21st Century, the idea exploded. I mean this to say that it fully emerged from the realm of the New York Review of Books into that of the bestseller lists, and also I mean to say that the idea ceased to have a coherent identity. As the idea drifted—into the deliberately difficult title of a Stephen Jay Gould book, into the branding of a quarterly magazine, into the jargon of marketing consultants and their jabbering ilk—its meaning shifted in several directions at once. How on earth do people who communicate in buzzwords keep straight all the pluralistic (foxy?) usages of this one big (hedgehoggish!) concept? I understand that phrases, like words, can change their meanings over times. I understand, further, why the Archilochus adage has been enjoying its extended cultural moment: Its binary elegance slices a complicated world into tidy parts; its philosophical pedigree masks its brute simplicity; its Gladwellian polarity suits the contemporary culture of thought, such as it is; it’s fun to do self-diagnostic quizzes. I totally get why someone as otherwise astute as Silver—so clearly a hedgehog in Berlin’s sense, given his systematic central vision—should prefer to be thought of as a fox: Foxes are foxy.